I normally don't write reviews for anything other than artisan chocolatiers but, I had to make an exception for Pillsbury as I have happened to love the Pillsbury Doughboy since I was a little girl. I could never get enough of watching him get the poked in the belly and then giggling afterwards a much awaited event that occurred at the end of every commercial. 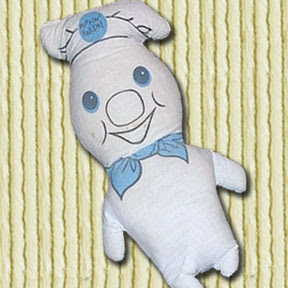 My obsession with him was such that my mom saved the box tops and got me my very own stuffed Pillsbury Doughboy. When he first arrived, I was horribly disappointed as honestly, he looked nothing like the Pillsbury Doughboy I saw on TV - but my mom told me he had dried out a bit in the mail and that was good enough explanation for me. He was my favorite toy - gracing my bed up until I went to college. I still have him. So when I was contacted by Pillsbury, I couldn't say no - and I was glad I didn't. Besides some other non-chocolaty goodies like Grands, Crescents and Pillsbury Turnovers (why doesn't Ralphs carry these? 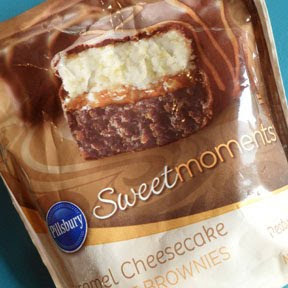 ), Pillsbury has just introduced SweetMoments Bite Sized Brownies. This is not a completely apt description because they are so much more than just brownies. 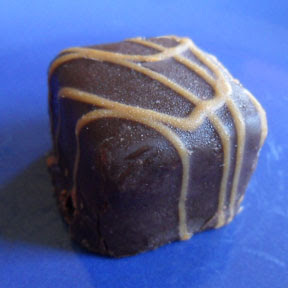 True, they are bite sized and have a brownie in them, but there is no mention of the silky cheesecake, the layer of caramel or raspberry and the fact they are frozen. Somehow you just know if you take some brownie, raspberry, cheesecake and coat it with chocolate and then freeze it - you know how all the ingredients together are just better - and they are. Each bite packs a big flavorful and decadent punch - perfect for after a meal when you're craving something sweet. The cheesecake is silky, the brownie has a nice chew to it and the caramel or raspberry filling is satisfying but not overpowering. After you bite into these little morsels, you can enjoy seeing the layers of goodness which somehow always makes it more pleasurable in much the same way there is a big difference between a slice of cake and a heap of icing versus the cake being nicely layered. But the best part of the deal is it's only 190 calories for three. The only problem is - how to limit yourself to three? Thankfully there are 12 in a bag - and a steal at about $3.00/bag. Found in the refrigerated section of discerning grocery stores.